In my latest blog in this PowerShell series I showed how to install Dynamics NAV on a remote or local computer with PowerShell. I use the Demo Database that is included with the Dynamics NAV DVD to create the default tenant database. This PowerShell script restores the database backup to a new name in a given path on a given SQL server. write-host "Restore of " $NewDatabaseName "Complete"
To be able to use this the SQL Management tools must be installed. After the database has been restored the script makes the NETWORK SERVICE account an owner. This can of course be customized to another user(s). The following steps are needed to set up multi tenancy. First I need a temporary Dynamics NAV service Instance. Next step is to export the application to a separate database and change the service configuration to multi tenant. Set-NAVServerConfiguration -ServerInstance $ServiceInstance -KeyName MultiTenant -KeyValue "true"
Set-NAVServerConfiguration -ServerInstance $ServiceInstance -KeyName DatabaseName -KeyValue ""
I like to create empty tenant databases that I can later pick up and use for customers. Here I create ten databases and attach them to the service to initialize the common tables. Since I did all this on my developement machine I wanted to move all the databases to the production SQL server. So I created a script to backup all the databases. write-host "Backing up database $dbName on $dbServer"
And the last step is to stop and remove the temporary Dynamics NAV service instance. 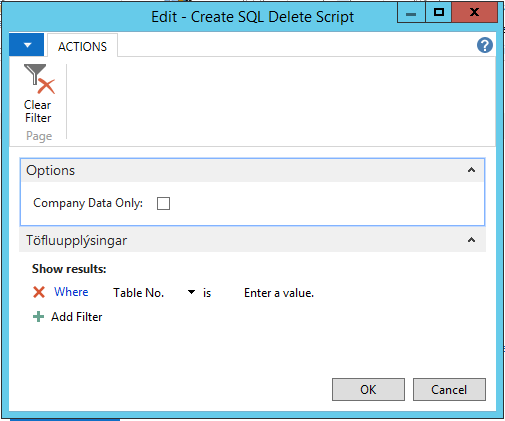 On the production SQL server I restored the databases with this script. I also give the service user owner rights to the databases. $backupDevice = New-Object Microsoft.SqlServer.Management.Smo.BackupDeviceItem $BackupFile, "File"
$resLog.LogicalFileName = $RestoreDetails.Rows["DatabaseName"] + "_Log"
$resFile.PhysicalFileName = $NewDatabasePath + $RestoreDetails.Rows["DatabaseName"] + "_Data.mdf"
$resLog.PhysicalFileName = $NewDatabasePath + $RestoreDetails.Rows["DatabaseName"] + "_Log.ldf"
$q = "EXEC sp_addrolemember @rolename = N’db_owner’, @membername = N’$ServiceAccount’"
Next we take a look at creating the server instance on a remote machine, mounting the tenant and creating the ClickOnce website along with the Web Client. This will be my first post in a series of many that will cover a Dynamics NAV installation in Azure or on Premise. Everything is set up as on premise so if you are planning to use this on Azure you will need to run the scripts from an Azure VM. Every machine that I am installing on needs to allow PowerShell Remote Session. Make sure that the Windows Management Framework 3.0 is installed. Then make sure that you enable Remote Management. That should take care of the basics and now we will be working on our management machine where all the installs will be running from. In the directory that I store my scripts, I create a subfolder for each machine that requires an install. In that folder I have few files. First I have a file called Set-MachineSettings.ps1 that contains the setup parameters for this machine. Only two lines. In the parent folder I store the general deployment settings file called Set-DeploySettings.ps1 that includes all setup settings that for the deployment. $NAV_AdminRemoteDirectory = Join-Path $NAV_RemoteFolder "NAVAdministration"
$NAV_NavDvdRemoteDirectory = Join-Path $NAV_RemoteFolder "NavDvd"
$NAV_CertRemoteDirectory = Join-Path $NAV_RemoteFolder "Cert"
# Specifies the security certificate PFX file and password to use with Microsoft Dynamics NAV client services. # For more information about certificates, see http://go.microsoft.com/fwlink/?LinkID=285869. # A sample pfx file called MyAzureVM.pfx is available in the WindowsPowerShellScripts\Cloud\Examples\HowTo directory. The password is pfxpassword. # Specifies the security certificate PFX file and password for configuring https protocol for web server authentication with the Microsoft Dynamics NAV Web Client. # Specifies the ClickOnce signing settings for the NAV Windows Client. # If you sign the deployment, then the ClickOnce install page presented to end users will say that the publisher has been verified. # If you don’t sign, then end users will get warning that the publisher cannot be verified. # To sign ClickOnce, set $NAV_ClickOnceCodeSigningPfxFile to the path and name of the certificate pfx file, and then set $NAV_ClickOnceCodeSigningPfxPassword to the pfx password. # A sample pfx file called ClickOnceSignature.pfx is available in the WindowsPowerShellScripts\Cloud\Examples\HowTo directory. The password is clickoncesignaturepassword. # To not sign ClickOnce, set the values to $null. # mage.exe – Part of the Microsoft Windows SDK for Windows 7 and .NET Framework 4, which can be downloaded from http://www.microsoft.com/en-us/download/details.aspx?displaylang=en&id=8279. 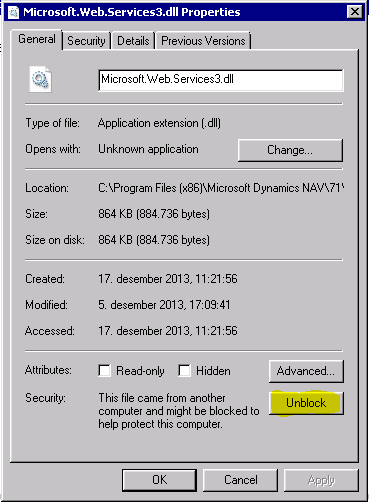 This is included with Windows 8 and Windows Server 2012. # makecert.exe – The Certificate Creation tool to generate x.509 certificates for testing purpose. This tool is available as part of the Windows SDK, which you can download from http://go.microsoft.com/fwlink/p/?linkid=84091. # The following variables specify the path and file name of the tools. # Windows PowerShell includes a set of variables that enable you to customize its behavior. Finally I have the script Install-NAV.ps1 in each computer subfolder that I execute with PowerShell ISE as Administrator. Write-Verbose "Importing certificate for https authentication on remote machine..."
# then you can customize the scripts to accomplish that. This sample code copies a single file to the VM. # Update the code with your file(s) and uncomment the line. The machine is now ready for the next step, to install NAV Server Instances, Tenants, ClickOnce and Web Sites. Before I will show that the next post will be about creating the databases with scripts. I am not sure that you will find safer place to place your SQL backups than on a Microsoft Azure Storage. Azure keeps three copies of all the data within the data center and if you enable Geo-Replication another three copies will be kept in another data center somewhere else in the world. Running the NAV SQL Server on a virtual machine within Azure also means that the SQL database is also in six places, just to make sure. I moved my NAV services to Azure and wanted to make sure that the backup would be as good as everything else. To backup directly from SQL to Azure Storage you will need SQL Server 2012. There are most likely other third-party solutions to move you backups to Azure. There even is a program from Microsoft – SQL Server Backup to Windows Azure Tool – that will pick up files a local folder(s) and upload them to the Azure Storage. I am using this tool to upload backup from my MySql server. If you have SQL Server 2012, on Azure or on premise you can backup directly to your storage account. You will need Cumulative update package 2 for SQL Server 2012 to update your installation to the required version to get this feature supported. How it works is being shared in many places, for example on SQLServerCentral.com. I followed these instructions and created a storage account in USA. My SQL server is running in North Europe and I wanted to make sure that the backups where on another continent. You can see that my company name, Kappi, is in the script. If you want to use this script you need to update the storage URL and the credential name. 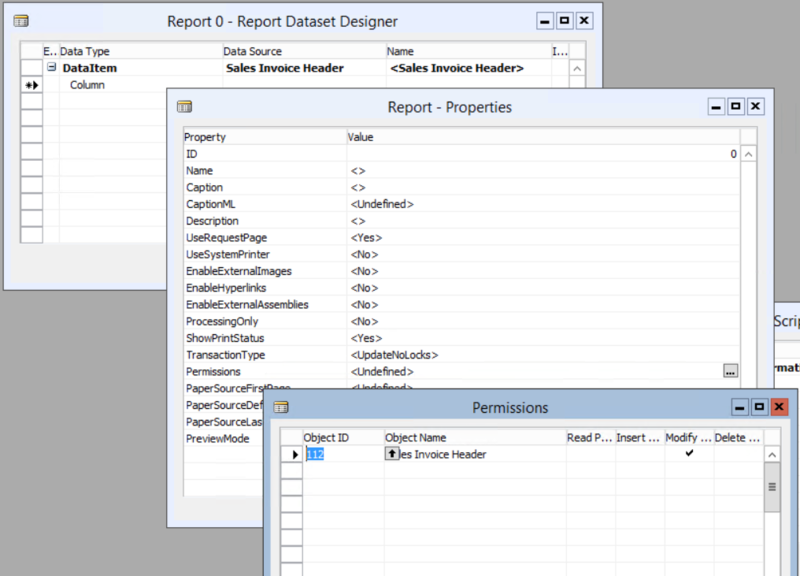 What happens is that all databases are read and within them the script looks for the table ‘$ndo$dbproperty’. If this table exists then I add this database name to a temporary table. I then loop through the temporary table and start a backup for each database. My plan is to do a full backup once a week and transaction backup every six hours. The line ‘IF @dw= 1 AND @hh < 6′ triggers a full backup on Sundays before six in the morning. Then I created a job that executes every six hours to start the backup. 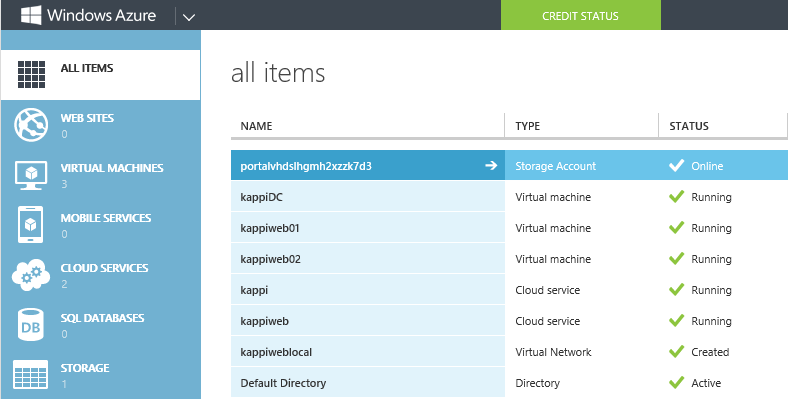 Since I came home from Seattle MVP Summit I have been testing the Azure hosting environment. I wanted an environment to host my web sites and my Dynamics NAV. I created three virtual machines with two cloud services. One computer is a domain controller and the other two have identical setup with Web server, MySql server and MSSql server. The first thing I needed to do was to plan my network. If I use the default setup then the virtual machines are not guaranteed to always have the same internal IP addresses. I am using active directory domain controller (why I will tell you later) that will act as a DNS server for all the computers. In my Virtual Network I created a separate subnet that will host only the domain controller. The domain controller will always be given the first available IP address on that subnet and that way I can add a DNS server to my virtual network. I created a separate cloud service for my domain controller computer and I am using it as a management computer for the others. For the two web computers I used the Web Platform Installer to install PHP and MySql. I also installed phpMyAdmin to manage the databases. I added a master/slave relationship between the MySql servers so that every change on each of them is replicated to the other one. I installed MSSql server 2012 on all three computers. I wanted to be able to mirror my databases and I use the domain controller MSSql server as a witness to the mirroring. The mirroring setup in MSSql is done for each database and I always have a principal database and a mirror database. When the principal database in inaccessible the roles are shifted and the mirror becomes the principal. I am hoping that Dynamics NAV will support this failover functionality soon as this is built into the MSSql native client. I added an extra hard drive for file data and another extra hard drive for database data to the web computers. When there is a domain controller you will have the option to use DFS Replication that can automatically synchronize folders between computers. I use this functionality to replicate my web folders between the web computers. I used phpMyAdmin to export the databases on my old host and copied that file and the web folders to my new server. I created the websites and imported my databases. At first I had PHP errors and needed to go into Handler Mappings and delete all references to PHP and then I used PHP Manager to create a new mapping. Finally I turned to Dynamics NAV. Since I am working with Advania to set up a Dynamics NAV hosting environment I wanted to make sure the all the installation should work through PowerShell. NAVTechDays 2013 had two sessions where Microsoft employees showed that by using PowerShell they where able to install NAV on Azure and on premise. I tried out the Example-1VM script that is provided with the NAV DVD and then started to break things down into smaller parts that would work in my private cloud. Currently I have several instances of NAV up and running and am planning to share the PowerShell scripts in another post later. The most suprising thing is that all three machines are small machines (1 core, 1.75GB memory) and still the performance is acceptable.